24" Deluxe Solid Corner Cubby includes 6 shelves and two side panels. 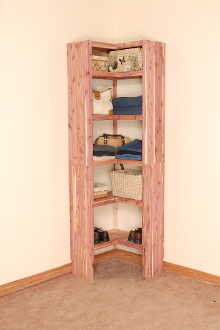 The 24" Deluxe Solid Corner Cubby is part of our eastern red cedar closet system. Each corner cubby includes 6 shelves, 2 sets of side panels and the required hardware. The solid shelves are 12" deep. The Deluxe Solid Corner Cubby is part of the deluxe solid cedar closet system which includes the wall kit, cubby kit and shoe cubby kit. All pieces in our closet system are made from eastern red cedar that is sustainably harvested. Exterior Width (from Corner to Each End): 25"
Shelf Width (from Corner): 24"